Working as a support machine, the Kori Marsh Buggy/Personnel and Cargo Carrier is an important piece of any machine fleet. It transports cargo, personnel and fuel to and from the staging area. 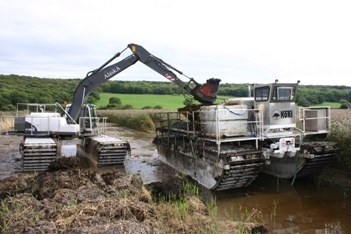 This allows the Kori mounted excavator to stay at or near the excavation site, reducing wear and tear. The Kori Marsh Buggy also makes laying fiber optic cable easier and quicker. A Vermeer D24 trencher mounted on a Kori Marsh Buggy undercarriage lays cable up to eight feet deep in a trench only inches wide, while also setting warning flags. Kori Marsh Buggies can also be custom equipped with drills, seismic equipment, hydraulic booms, wood mulchers, and helicopter pads. Diesel power is the standard for Kori Marsh Buggies and Personnel Carriers.